Opponents of human therapeutic cloning are beginning a legal challenge to the granting of the first UK licence permitting the technique to be used. It was awarded to Newcastle University scientists looking into new treatments for conditions such as diabetes. Applications for such licences are considered by the Human Fertilisation and Embryology Authority. But critics such as the Pro-Life Alliance say this licence does not fulfil legal criteria in the HFEA Act. Solicitors acting for Peng Voong, of the Lawyers' Christian Fellowship, served an application for a judicial review on the HFEA. The application will be scrutinised in the High Court. If a decision is made to allow the review to go ahead, it would take place in the New Year. David Foster of Barlows Solicitors, Guildford, which is acting for Mr Voong, said: "This is about a public body being open and honest about what it's doing. "We are simply asking some basic questions - when was the application made, what exactly was it for, who granted the application and what their experience and qualifications were." Julia Millington of the Pro-Life Alliance said it was supporting Mr Voong's legal challenge. "We wrote to the HFEA prior to the issuing of the licence expressing our concerns and requesting further details of the licence application. "Such information was not forthcoming and we welcome the fact that this legal challenge will address concerns regarding the lack of transparency in the HFEA's decision-making processes, as well as legality of the licence itself." She added: "Human cloning is profoundly unethical, particularly when the cloned embryos are manufactured for their constituent parts and thereafter destroyed. "The HFEA has power to grant human cloning licences but only if certain rigorous conditions are met. We believe that this licence does not fulfil the conditions of the Human Fertilisation and Embryology Act." Ms Millington said: "It has been erroneously reported that the licence will further research into certain diseases. However the licence that has been granted does not include research into any specified disease." The HFEA said it did not comment on legal proceedings. A spokesperson for the Newcastle Human Embryonic Stem Cell Group said: "We feel that the majority of people in the UK support our work but we accept that everyone has the right to express their views on this issue." Therapeutic cloning has been legal in Britain since 2001. It is carried out for medical reasons. Even though the science is similar, the technique is different to reproductive cloning, which aims to create a human being. 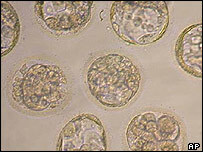 The cloning technique, known as cell nuclear replacement (CNR) involves removing the nucleus of a human egg cell and replacing it with the nucleus from a human body cell, such as a skin cell. The egg is then artificially stimulated. This causes the egg to divide and behave in a similar way to a standard embryo fertilised by sperm. The eggs used are left over from IVF treatment. They are donated by couples, and would otherwise have been destroyed.